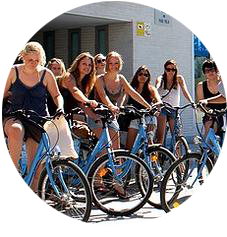 We organize Private Bike Tours for groups with the possibility to customize your itinerary. You can choose one of our Bike Tours or you can design a group tour that will suit your own needs. We believe they are a way to build loyalty, to bring your company and clients, as well as providers, closer, in addition to strengthening ties between people and company. So, we will make sure to reach your motivational idea and goals. 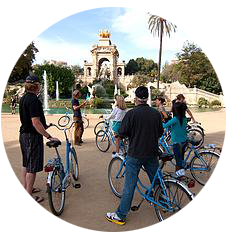 Our Bike Tours are optimized to break the routine besides discovering our city and its famous sights, architecture, culture, traditions, anecdotes… We want you to see Barcelona in a different and fun way. We know from experience that one learns and grows more knowing and sharing other cultures. We work to meet your needs in the most pleasant, dynamic and organized way. We want to make your visit a cultural experience full of memories where you will learn about our customs, origins, secrets… We realize our itineraries using mostly peaceful streets without traffic, bike lanes which makes it very safe and fun for all ages. Departures and arrivals of the Bike Tours on schedule to make sure you will arrive on time for your next activity. Larger groups are divided among multiple guides plus mechanic assistants to ensure the safety and control of the group.